Featuring 38 songs and over seventy-two minutes of music, Children's Songs sung by Susie Tallman and Friends is a playful symphony of guitars, train whistles, banjos, accordions, clanging spoons, and whistling that will delight and inspire little ones as well as their parents! Playful and educational, this disc combines old favorites with clever new arrangements, making it's music - a pure magic! As a music teacher I strive to provide the very best recordings for my children. Ms. Tallman's Children's Songs exceeds my high expectations with quality singing and musicianship. Songs are performed in a fun manner that engages children on all levels of creativity. The humorous and witty arrangements entertain parents as well. Children's Songs is sure to become a family favorite. - Shelly Ley, Music Educator, Albuquerque, New Mexico. My 19 month old boy LOVES Susie Tallman. All of her cd's are great and this is no exception. 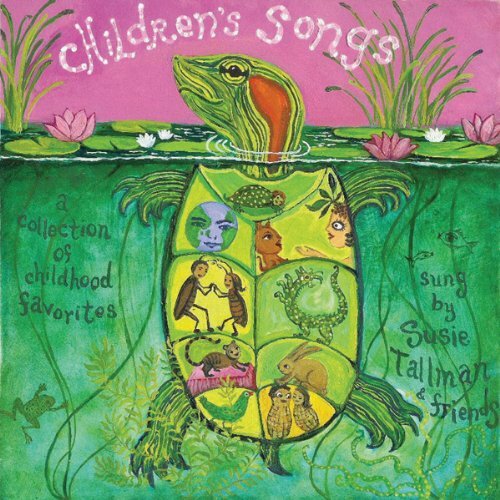 I get so bored of "comercial" childrens music however, I can always handle Susie Tallman cd's. Great sing-a-long for mom & baby. The vocal talent is top notch, varied and avoids coming across as hokey, but hits enthusiastic right on the head! The songs are the complete classic lyrics--you'll hear bumble bees squished and rotten peanuts leading to serious tummy aches - set in modern arrangements. Many are kissing cousins to the classic melodies, but several are completely reimagined for a very different experience indeed. Production values are excellent across the board. All-in-all, this is a true family favorite and has been in steady rotation since it came home. My wife and I also give high marks for the faithful, unsanitized lyrics; the songs sound just the way we remember them! Which makes this CD a great way to learn the words to classic children's songs. This is one of our favorite children's CDS as it's long enough to avoid getting dull and fun to sing along to. It really helps us remember the songs we enjoyed growing up. Yes, there's a new twist to the tunes to some of them, but I didn't find it offensive at all. The 5 Monkeys Jumping on the Bed song is really enhanced by the funky tune, in my view. My children (ages 17, 10, & 4) love the CD. We started listening to it about 3 years ago. We sing many of the songs in the car as a family. The teenager took the CD to download the songs on her iPod and lost it so I bought this most recent copy to replace it. We are a normal family that happens to love this happy uplifting CD.